September 26, 2015 By This post may contain affiliate links. Dress up your Halloween treats this year by making a batch of sweet little Charlie Brown Ghost Brownies. 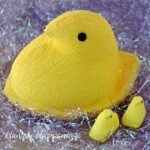 They are as cute as they are yummy. How did you feel the first time you saw Charlie Brown get a rock for trick or treat? Getting decked out in a homemade costume and running through the neighborhood collecting candy made for the most amazing night of my year and the thought of being the kid that even adults ridiculed, broke my heart. Last weekend, I hung out with Charlie Brown and the rest of the Peanuts Gang at Cedar Point. 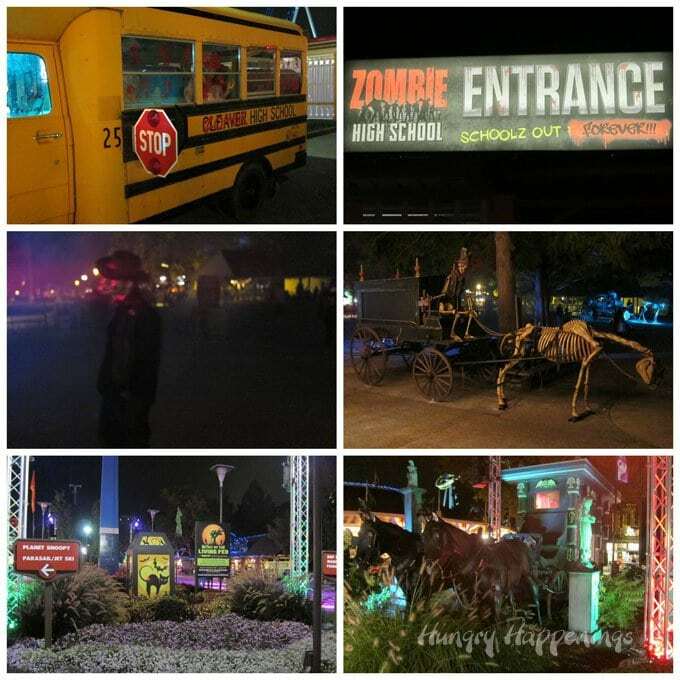 I attended Bloggy Con 15 and one of the perks of joining about 150 other bloggers to learn how to take our blogs to the next level was getting 3 day passes to the amusement park. Driving into the park at Halloween was really an experience in and of itself. First you cross over a bridge with spectacular views of Lake Erie, then you are greeted by Snoopy, Charlie Brown, Linus and Lucy topiaries all decked out with pumpkins, corn stalks, and hay bales. This was the perfect time of year for my husband and I to visit Cedar Point. The weather was perfect and the entire park was filled the most amazing Halloween decorations. You can imagine how excited I was to see them all. The park really goes all out for this holiday. I was so impressed by the magnitude of the decorations. They were as thrilling as the rides. During out stay we were able to visit 6 haunted houses and walk through a few outdoor haunts. Our favorite was Zombie High School. It was so cool walking the halls of Zombie High, wandering through the nurses office, science lab and locker rooms and even visiting the insanely gross cafeteria. Imagine walking through a cafeteria, tray in hand, being served intestines and bloody body parts. The whole scene was disgusting, but so incredibly well done that I was in awe. I tend to walk through haunted houses having a totally different experience than most other guests. While those around me were screaming, I was too busy just taking it all in, admiring the well thought out decorations and room designs, and imagining how I could use the ideas for our own annual Halloween party. Cedar Point does such an incredible job with their haunts. I was seriously impressed. I was also impressed with the newly renovated Hotel Breakers. Our room was tastefully decorated, really comfortable, and immaculately clean. The large suite, complete with a living room, kitchenette, bedroom, bathroom, two televisions, a coat closet, and a balcony had a spectacular view of Lake Erie. Every morning we woke to the sound of seagulls and the the gentle crashing of the waves on the sandy shore. My husband spent hours on the balcony while I was at the conference. It was a great place to unwind. Next time we visit the park we definitely want to plan an extra day so we can really enjoy the lake. The resort offers all sorts of water activities and lounge chairs for those who just want to rest and relax at water’s edge. The decorations in the two story lobby area were really spectacular too. They combined a bit of elegance with a bit of gore. I loved it. I was really busy with the conference during out stay but made sure we had enough time to ride my favorite roller coaster, the Millennium Force, a few times. Flying down the first hill, looking out over Lake Erie, feeling like the car might dip right into the water, then quickly curving to the right is one of the most exhilarating things I’ve ever experienced. I could ride that roller coaster over and over again. In between riding rides and hanging out with ghosts and goblins, I couldn’t resist doing some shopping. Peanuts characters can be found on just about anything you can imagine. I found some of the cutest t-shirts and just had to buy one with Charlie Brown in his ghost costume. The shirt says “I Got a Rock.” I’ve always had a soft spot in my heart for Charlie Brown in his sheet full of holes. The t-shirt inspired me to create these cute Charlie Brown Ghost Brownies. I used Wilton’s Brownie Pops molds to bake my brownies, then covered them in decadent chocolate ganache and draped white modeling chocolate over top so that they looked like ghosts. Being I was topping the brownies in luscious chocolate ganache, I went the easy route and used a brownie mix knowing the ganache would make them taste decadently good. 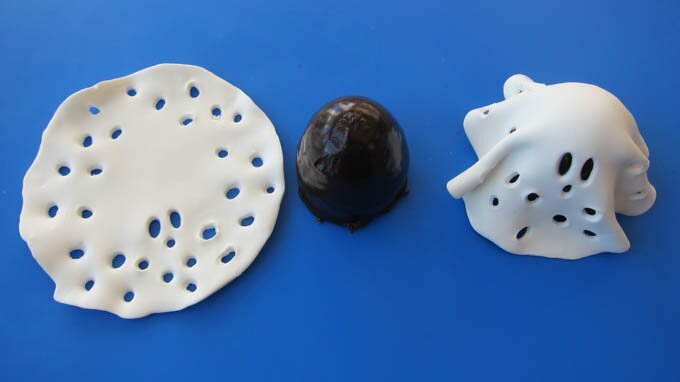 When using the silicone mold, be sure to spray some non-stick spray just inside the cavities, then brush it around the mold. I try not to spray the whole mold, as the spray builds up and the silicone gets sticky. 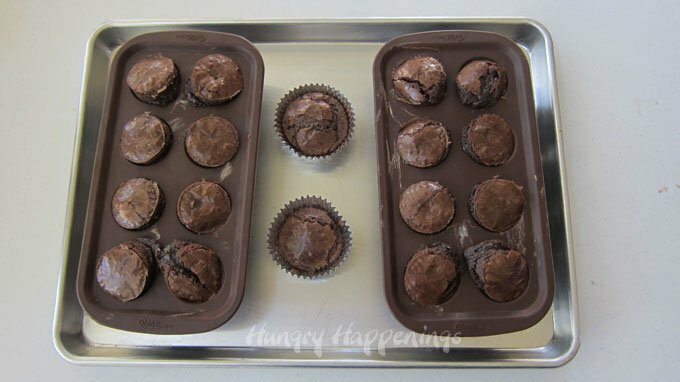 Set the molds on a baking sheet then pour brownie batter into the cavities up to the fill line. I used a family size box of brownie mix and had a bit of extra batter, so I made two cupcakes. If you use a smaller box or your own recipe you may have fewer brownies than I did. 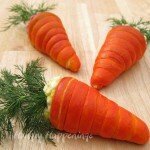 Bake at 350 for 26-30 minutes. 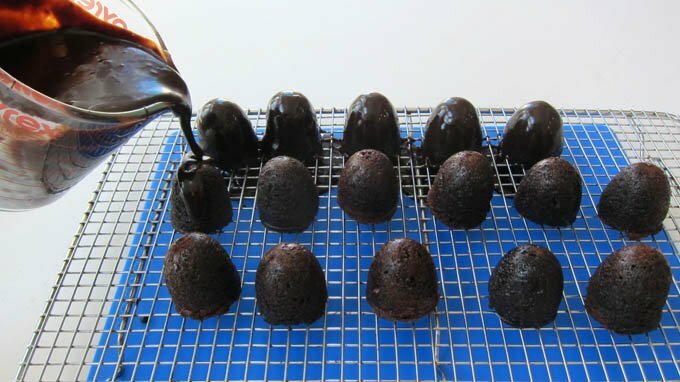 Remove the brownies from the oven and let cool for just 10 minutes, then cut the domed tops off. They will get crunchy and hard as the cool, so it’s much easier to do this while the brownies are still warm. Then let them cool completely before removing them from the molds. 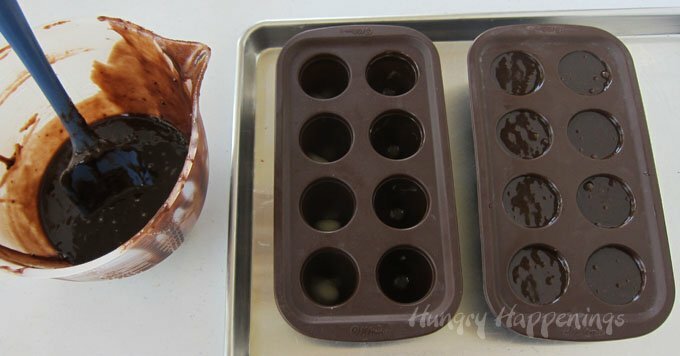 Turn the mold upside down and press on the top and the brownies should pop right out. 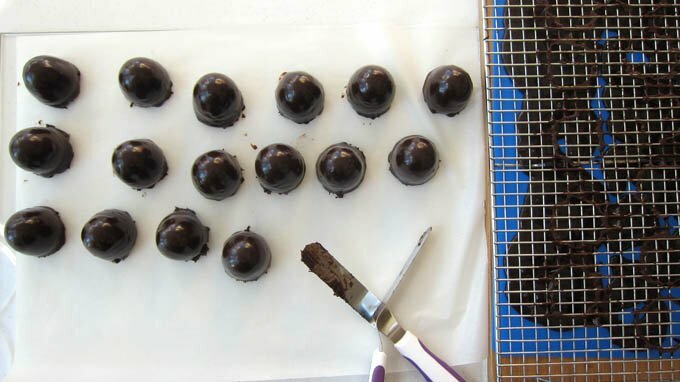 Set the brownies on a cooling rack that is set over a non-stick silicone mat or some parchment paper. Make the chocolate ganache once the brownies are cooled and pour it over the tops of the brownies allowing it to completely cover them. You’ll have excess ganache, You can scoop it back into a bowl, let it sit at room temperature for a few hours until thickened and use it to make some chocolate truffles. Allow the brownies to sit for about an hour until the ganache sets firm then use a metal spatula to remove the brownies from the cooling rack. 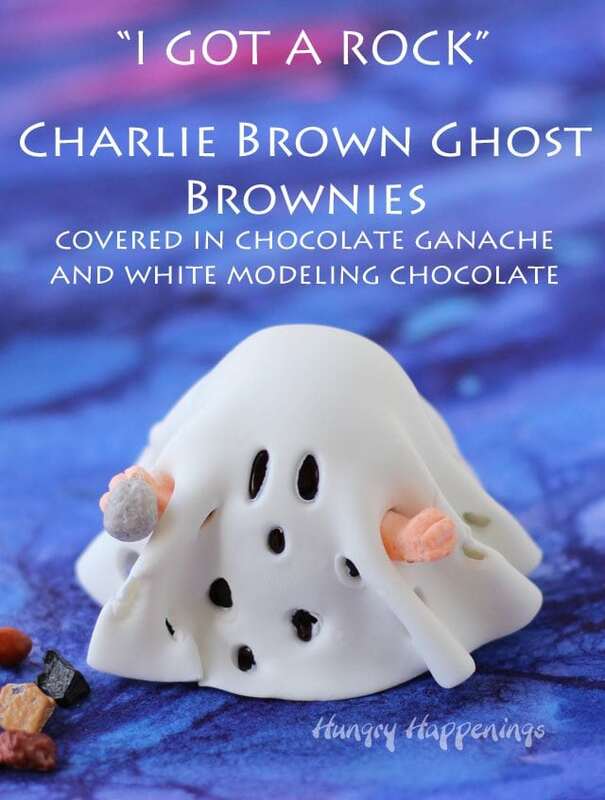 To make Charlie Brown’s ghost costumes, you’ll need to make some White Modeling Chocolate. 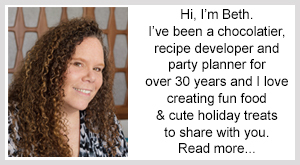 You can find the recipe and tutorial on my Chocolate Making Tips Page. Roll out some bright white modeling chocolate really thin. 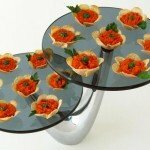 Cut it using a 4 inch round cookie cutter. 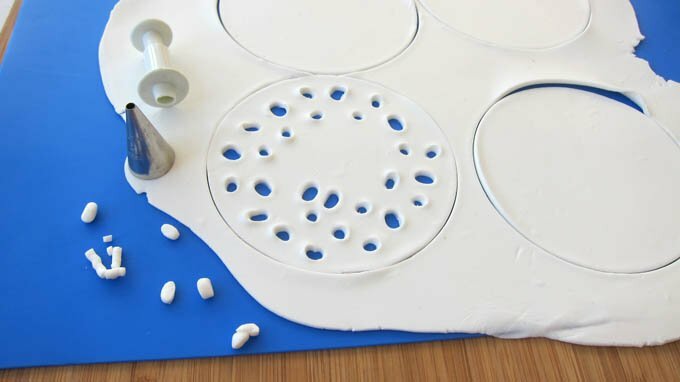 Cut small holes to create two eyes and one mouth then lots more holes around the bottom 2 inches of each circle. Pinch around the edge of the circle to thin out the edges. Drape over the brownies and gently pleat to create the look of a ghost. 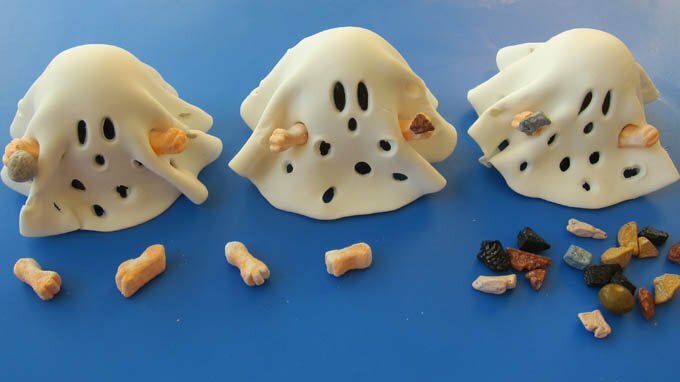 You can leave the ghosts as they are or you can add some tiny marshmallow hands and a chocolate rock. 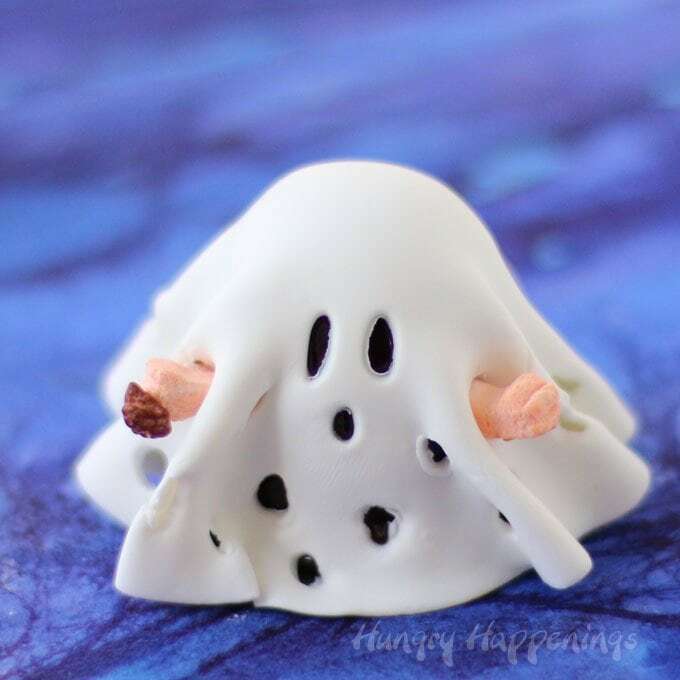 I found the tiny little marshmallow hands in the limited edition boxes of Kellogg’s Apple Jacks with Halloween Skeleton Marshmallows, but you can make them using modeling chocolate if you can’t find the cereal. I attached a tiny chocolate rock to each hand using some melted chocolate. 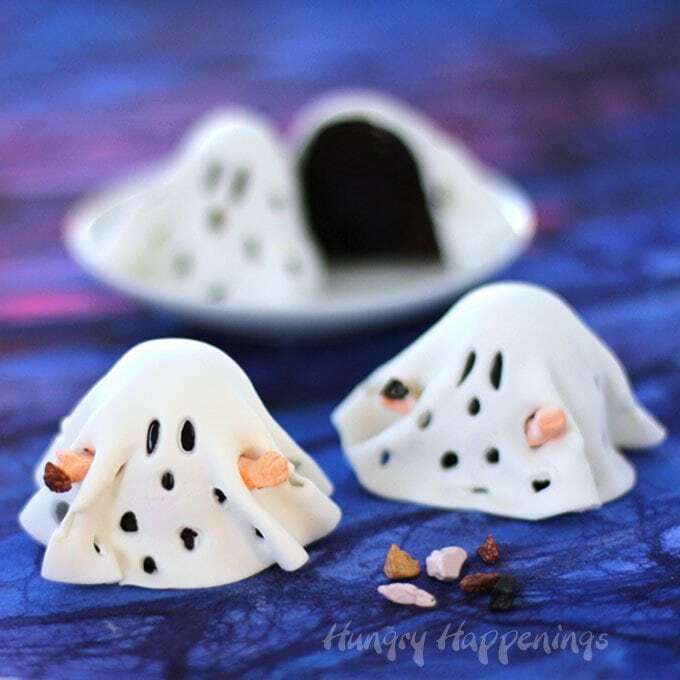 Chocolate brownies covered in chocolate ganache and white modeling chocolate are decorated to look like Charlie Brown Ghosts. 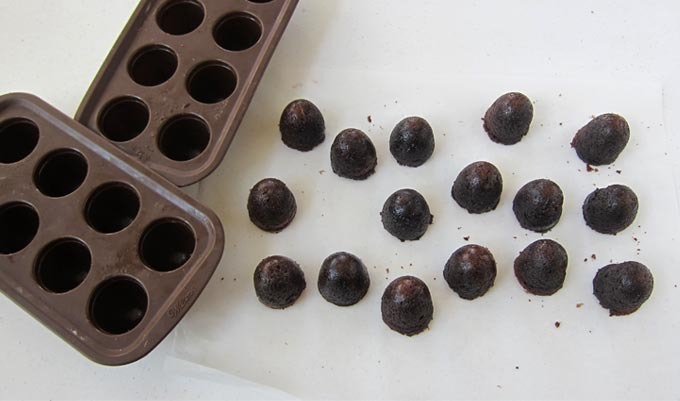 Spray 2 silicone brownie pops mold with non-stick spray. Make brownie mix according to package instructions. Pour batter into mold, filling just to the fill line. 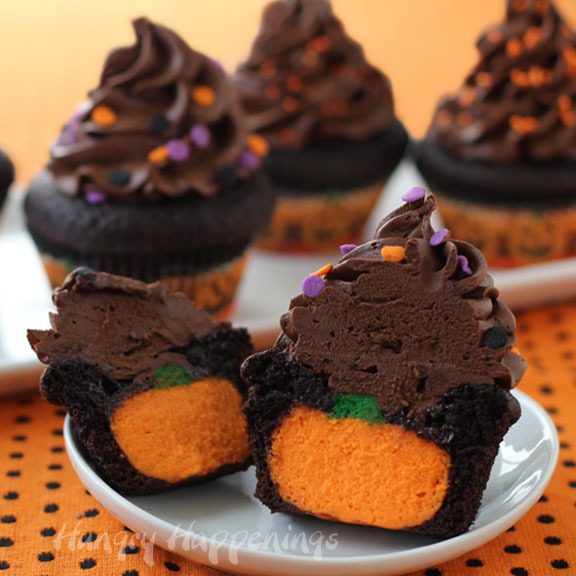 If you have extra batter, fill a few cupcake liners. Bake brownies for 26-30 minutes. Remove and allow to cool for 10 minutes. Cut the domed tops off the brownies then allow to cool completely. 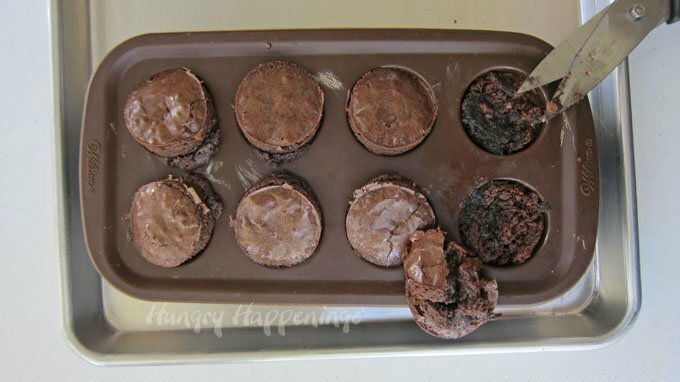 Remove brownies from mold and set on a cooling rack. Heat heavy whipping cream in a saucepan set over medium heat, just until bubbles form around the edge of the pan. Pour over chopped chocolate and allow to sit for about 3 minutes. Pour over each of the brownies. Roll out modeling chocolate and cut into 4 inch circles. Cut eyes, mouth and lots of other holes to create ghost costumes. Drape over brownies, pleating as needed. 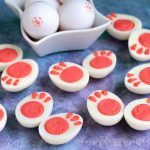 If using, insert two marshmallow hands in holes in the modeling chocolate. 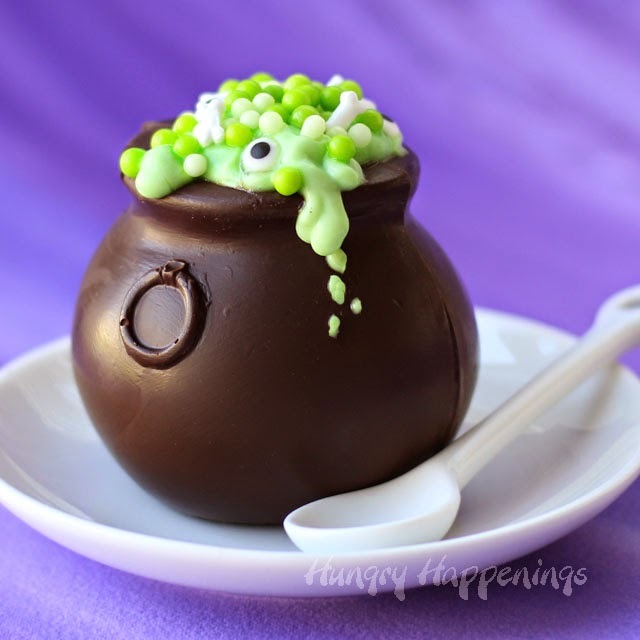 Attach a tiny chocolate rock using some melted white candy melts. 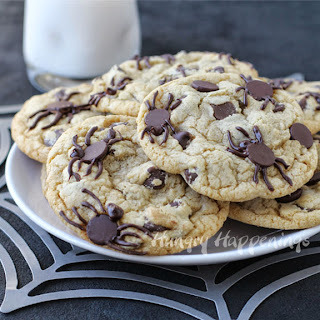 Find the recipe for making White Modeling Chocolate on my Chocolate Making Tips page. Cute cute cute, I think Charlie Brown will be happy again! Thanks:) If Charlie Brown came to my house on Halloween, he’d get a big treat not a trick! So adorable!! The autumn season isn’t official unless I have seen the Great Pumpkin!!! Love Charlie Brown. Eeeeek! This is me shrieking..in a good way! This is the cutest little thiiinngg! 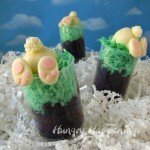 I have a soft spot for anything Charlie Brown and these sweet ghosts are hands down awesome. And speaking of hands..they just put this one over the top. I need a new box of cereal. The blogger trip sounds like loads of fun..except for the spooky houses..I’m a wimp. If I happen to miss the Charlie Brown specials on tv, I have the holiday 3-box set for year round viewing! I’m happy to have evoked a shriek from you, in a good way! I love poor ole’ Charlie Brown too and watching the Great Pumpkin is a must at this time of year. I used to be so afraid of haunted houses that I had not been in one since I was 12. Had a bad experience back then and it took us hosting spooky Halloween parties for me to get over it. I still can’t wait horror movies, though. I’m a wimp too! These are so. so. CUTE! Can u make the Charlie Brown brownies ahead of time and im taking them to a potluck halloween party they will b in the shade for 2 hrs. Will they melt. Plz respond there just to cute. 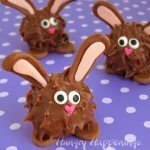 I love these and can’t wait to make them with my nieces! Can you tell me where you found the tiny chocolate rocks? All I can find are larger ones. Thanks!